Some of you may know JP as our resident pizza maker, but ever since he introduced us to the Garlic Glazed Chicken Pizza, I’ve been a true convert to the extraordinary blissfulness of pizza making nearly every Sunday evening. I even make my own crust instead of using frozen bread dough. Which, by the way, is an excellent substitute. And did I mention the pizza stone Patty gave me as a gift in the 90’s has been taken from it’s old permanent post as a chair seat where the wicker caning once was? I’ve arrived! I’m not quite sure what to do about the chair, though. Every now and again I get the biggest hankering for Frank’s Red Hot sauce. Usually I’d make some crispy, smothered chicken tenders or the gorgeous Buffalo Blue Burger, but this time my hankerin’ was on my beloved Sunday pizza night. After some himmin’ and hawin’ I came up with this delicious concoction. If you love pizza, check out the new Pizza tab at the top of this page. Par-baked Perfect Pizza Crust or one of your choice. This part is completely optional. I think the sauce is thick enough to stick on a non-coated chicken breast, but I didn’t want to leave anything to chance. Cook in a non-stick skillet, on both sides, until slightly browned and just cooked through. Once cooled use half of your Red hot Sauce to coat the chicken pieces. Bake in an oven that’s been pre-heated to 425°- 450° for at least a half hour. Bake on a pizza stone (that should go in the oven when it’s pre-heating too) for about 20-25 minutes until cheese is very bubbly and slightly brown around the edges. Hope you have a great weekend – off to see what pizzas I may have missed! 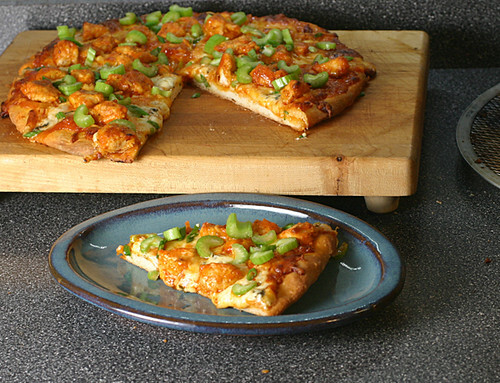 This buffalo chicken pizza looks amazing. I mean, I am hungry looking at the pictures lol. Wonderful job and post. That looks really good. We’ll have to get some Frank’s Red Hot Sauce. Soon. That looks so good! I am Biz’s twin sister. This is my first time to your site. I make a “brunch” pizza almost every weekend since I wake up late, it’s my breakfast and lunch. I love your version though, and its so much cheaper if you make it yourself! This is such a darn good idea! I think everyone on my house would love this! Buffalo chicken anything is my favorite! I have a BIG bottle of Franks hot sauce in my pantry 🙂 Thanks for sharing this recipe, the sauce recipe is different from what I normally do! This is such a great thing to have for the big game coming up this weekend! I always make my own crust. A friend passed on her family recipe, with the promise that I never share it. I have kept to that promise. This looks excellent. 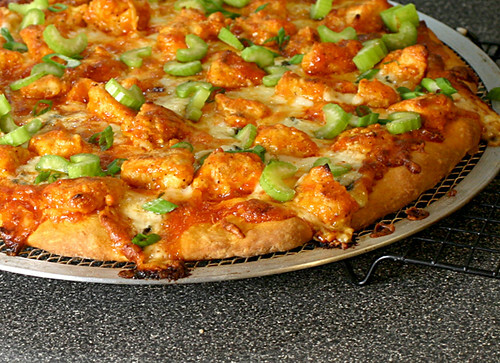 I have had Buffalo Chicken Pizza at assorted pizza places. It is one wonderful pizza.